For my editing, I generally use the Merriam-Webster’s or the American Heritage online dictionaries. My books collect more dust than they used to, which means I spend less time distracted by perusing nearby entries. My rate for learning new words has plummeted. A few months ago, I bought myself a calendar with a word for each day. I hadn’t owned one in several years and this one became lost in a sock drawer until well into January, but that’s for another post. Without any space to write down appointments or accomplishments, I enjoy the daily calendar as a way to mark the passage of time and I’ve saved many of the words I’ve torn off. I keep a stack on my desk. When I have time, I flip through and try to learn some unfamiliar words, such as calenture, moiety and nyctalopia. I position the calendar where I can easily see it and I look forward to the task each day. It is a gentle reminder to keep learning, while giving me a different challenge than writing, researching or reading gives. And, although there is no vocabulary quiz each week as happened in elementary school, I like to try to keep my word muscles exercising and stretching. You never know when you’ll get to use trichotillomania (an abnormal desire to pull out one’s hair) in a sentence. Knowing how unique puissant is compared to power and potent, even though they share a common Latin parentage, can help when choosing the perfect word. With the tens of thousands of words we learn as we grow, I’ve been amazed at how many words and definitions I’ve forgotten, misused or stopped using through the years. As a writer, I know that words are my business. The calendar reminds me of that each and every day. Do you try to keep your vocabulary growing? If so, how do you do it? Elizabeth King Humphrey is a writer and editor. Her The Feminist Movement Today (Mason Crest, 2013) was recently selected for the Amelia Bloomer List. I can honestly say I don't do a whole lot to keep my vocabulary growing, but I definitely agree that it's important! 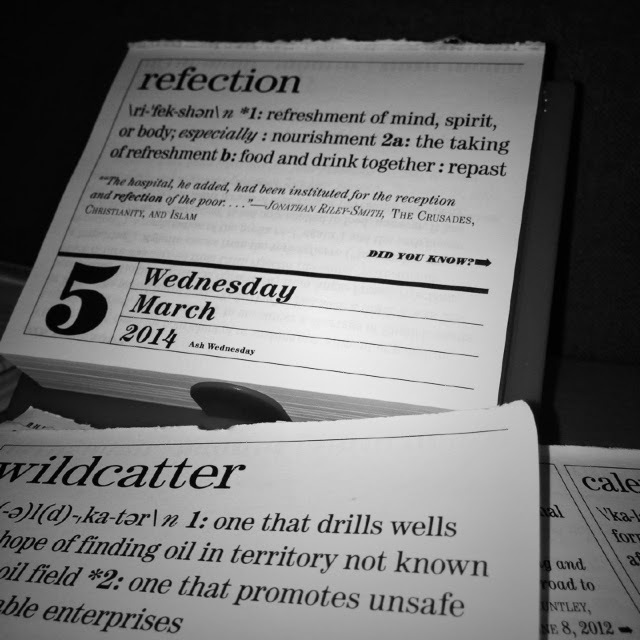 I like the idea of a Word a Day Calendar. Since it's already March, I might see if I can find an app or one of those daily e-mails you're talking about to help me. Good post! I have the word of the day calendar! I also check out words used in Words with Friends! As a writer, you have to improve and develop your vocabulary. Otherwise, writing becomes stagnant.